Popular narratives paint the Indian farmer with a broad brush. The dominant image is that of a farmer—male, of course—gazing benevolently at his vast fields laden with lush crops–the image created by Bollywood. The truth though, is that farmers in India are as diverse as the country itself. So are the challenges they face, depending on where they are located, what they grow, the kind of farming they do, and so on. Which, obviously, means that there can be no one-size-fits-all approach to address these challenges. And that’s where we are failing our farmers, especially rainfed farmers. Of the five major crops grown in India—paddy, wheat, pulses, cotton and oilseeds—only wheat is almost entirely irrigated; the other four crops are unirrigated, or fall under the rainfed farming category. At approximately 55 percent of India’s gross crop area, rainfed farming constitutes a major chunk of the country’s farm sector. Rainfed farmers are small, marginal farmers with small plots of land who engage in monsoon-dependent farming.Rainfed farmers are typically small and marginal farmers who own small plots of land (less than five acres) and engage in monsoon-dependent farming. The primary income of the rainfed farmer is cultivation and serving as labour to other larger farmers. According to the Socio Economic Caste Census (SECC) 2011, manual casual labour is the main source of income for 51.18 percent of rural households, followed by cultivation (30.10 percent of households). Being single-season and rain-dependent, rainfed farmers diversify their livelihood opportunities by engaging in activities such as poultry, fishery and so on, which play an important role in their income portfolio. They also maintain livestock, mainly small ruminants, like goats and sheep, that are not used for the purpose of dairy unlike irrigated farmers. Rainfed areas have high levels of poverty. Out of the bottom 10 poorest districts, seven are rainfed districts. According to the Rainfed Atlas of Revitalising Rainfed Agriculture Network (RRAN), about 66 out of the 100 poorest districts in the country are rainfed. The poverty map of India and the rainfed area map overlap. There are several reasons for this. Rainfed farmers lack the resources to enhance their livelihood occupation choices. Their dependence on the monsoon not only means that they have just one season of farming, but also that any change in the distribution of rainfall affects their production. Single-season, rain-dependent farming is of low productivity and offers farmers few options to diversify their crops. Moreover, the produce of single-season, rainfed farms is generally coarse cereals, which fetch low value at the marketplace. All this ensures that the rainfed farmer stays at a lower equilibrium of farming production systems. It is not a coincidence then, that the poverty map of India and the rainfed area map almost completely overlap. Ironically, these are the areas that get the least government attention or support; it is, in fact, irrigated farming that gets the lion’s share of both. Water: In order to make water available for irrigation, huge investments are made towards building dams and canals. Moreover, to increase area under irrigation, successive governments have allowed unregulated exploitation of groundwater, which is a matter of concern. Subsidies: Seeds and fertilisers, inherently linked with irrigation and used significantly higher in irrigated areas, are heavily subsidised by the government. According to the Rainfed Atlas of RRAN, fertiliser usage (kg/ha) is three times more in irrigated areas as compared to rainfed areas: 81.3 per cent of irrigated area farmers use high-yielding variety (HYV) seeds and fertilisers as opposed to 44.9 per cent of rainfed farmers. Thus, the bulk of subsidies finds its way into the irrigated areas. Market: The minimum support price mechanism, which ensures a floor price for agriculture produce, remains an important instrument adopted by the government to support farmers. The rainfed category gets a raw deal here too as the pie chart below shows. Clearly, then, public investments are not geared towards rainfed farming. The general pattern is to get water, get farms irrigated and then provide high-yielding seed varieties, chemical fertilisers and, finally, market access, too. Even R&D efforts follow this direction. All of which helps only a small section of the farming community. 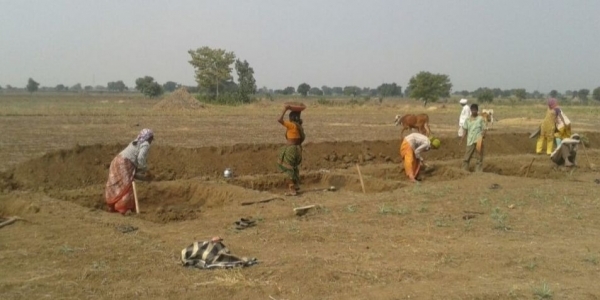 Local solutions to address the water problem: Small and marginal rainfed farmers need protective irrigation, which can come in the form of small water storage structures made by locals with local material. There is a strong case for a watershed development programme for every village and every farm in the country. Alternative sources of income: Indigenous poultry, fisheries and livestock such as goats and sheep help the rainfed farmer’s family in multiple ways. They provide nutritious food, additional income, and double up assets that can be sold during times of stress such as droughts or other calamities. Therefore, a special programme to support these activities is more a matter of design than budgets. Alternative crops: Food crops such as millets are sturdy, grow with little inputs and are nutritionally very important. RRAN has attempted to put some of these ideas—such as strengthening of backyard poultry, comprehensive revival of millets in rainfed farming systems, collectivisation of groundwater, and so on—in communities in Odisha, Andhra Pradesh, Telangana, West Bengal and Madhya Pradesh, and has experienced their potential in enhancing livelihood options and incomes of rural households. It’s only when we recognise the unique nature of rainfed farming and the specific challenges associated with it that we will be to find the resources and the solutions to nurture it. Until then, we risk continuing to look at the agriculture sector as a homogenous entity that can be addressed with a single set of solutions. This article was first published on India Development Review, and is republished with permission. Click here to see the original article. This article gives the views of the author, and not the position of the South Asia @ LSE blog, nor of the London School of Economics. Please read our comments policy before posting. Ashwini Kulkarni has been involved with issues related to rural development, especially rural livelihoods. She has worked with a range of stakeholders including villagers, civil society organisations (CSOs) and the government. Ashwini has been associated with Pragati Abhiyan for over a decade, working primarily on MGNREGA. She has also been associated with the national consortium of CSOs working on NREGA, and the Revitalising Rainfed Agriculture Network. Her writings have been featured in English and Marathi media.